The First Annual William Byrd Festival was held in Portland, Oregon in late August, 1998. Conceived by Founder of Cantores in Ecclesia Dean Applegate and Dr. Richard Marlow of Trinity College Cambridge as a marriage of music and scholarship, musicologist and professor Dr. William Mahrt of Stanford University was asked to participate in initial planning sessions and prepare the Festival's two inaugural lectures. Cantores in Ecclesia sang Byrd’s three Masses, and the week culminated in a Sacred Concert of motets and keyboard pieces featuring the choir and its resident organist, Delbert Saman. Encouraged by a successful first year, planning began almost immediately for the following summer, after which the Oregonian heralded the William Byrd Festival as a “valuable addition to Portland” (September 7, 1999). Cantores in Ecclesia is proud to have sponsored Portland’s William Byrd Festival every summer since its inception. From humble beginnings, the Festival has grown in scope and reputation, increasingly attracting scholars and musicians from the United States and Great Britain. A collection of Festival lectures by the prominent guest scholars was edited by Richard Turbet and recently published by The Church Music Association of America (musicasacra.com.) Entitled “A Byrd Celebration: Lectures at the William Byrd Festival, Portland Oregon 1998-2008,” this volume is a beautiful tribute to the Festival, its participants, and the vision of its founder and director; above all, it is a tribute to the enduring power and musical mastery of William Byrd. The annual William Byrd Festival opened with ‘The Minstrels follow after’, a concert sung by the Byrd Festival Consort and conducted by Mark Williams in the beautiful acoustics of NW Portland’s St. Patrick Church. At the concert’s conclusion, a complementary outdoor reception marked a festive beginning to the festival’s nineteenth season. The next morning, Saturday, August 6, Kerry McCarthy spoke to a capacity crowd on Music Lessons with Byrd in Holy Rosary’s Siena Hall. That evening at 5:30 pm Cantores in Ecclesia sang for the Vigil of the Feast of St. Dominic. This Pontifical High Mass, most fitting for a Dominican parish of the Western Province, was from the 1970 Missal and celebrated by the Most Reverend Basil Meeking. On Sunday, August 7th, the beautiful Office of Compline was again conducted by Blake Applegate, this year at Holy Rosary. As in prior years, the choir sang Byrd’s Masses for three, four and five voices; all three Pontifical Masses were celebrated by Bishop Meeking and offered at Holy Rosary, one using the 1970 Missal and two the Missal of 1962. This summer the festival was pleased to welcome Dana Marsh for its second public lecture, The Volatile Church of Byrd’s Childhood, on August 13th. Dr. Marsh is a respected academic, soloist and conductor with a broad-ranging career in the field of historical performance. On the afternoon of Sunday August 14h, following a sung Mass at Holy Rosary Church, Dr. Marsh conducted the choir for Choral Evensong at Trinity Episcopal Cathedral. Evensong was preceded by one of the highlights of each year’s festival, the annual recital by Mark Williams on Trinity’s Rosales organ. This year’s recital was entitled The English Organ. The third and final lecture of the 19th annual festival was August 20th in Siena Hall, Holy Rosary Church. William Mahrt of Stanford University spoke on The Elizabethan Book of Common Prayer and its Music. That evening at St Patrick Church the festival drew to its close with Sing Joyfully: Music by Byrd, Dering, Gibbons, Tomkins and Weelkes, Mark Williams, conductor. A gala reception for artists and audience members immediately following the concert signaled a successful conclusion of this summer’s William Byrd Festival as it looks forward to its 20th anniversary in 2017. The eighteenth annual William Byrd Festival was lovingly dedicated in memory of David Trendell, who died suddenly in London on October 28, 2014. Dr. Trendell first joined Cantores in Ecclesia for its fifth Annual Festival in 2002, and his death was a personal and professional loss to us all. He brought not only scholarship and erudition to our efforts, but a warmth, good humor and delightful energy that cannot be replaced. He is sorely missed. Instead of its customary opening concert, the William Byrd Festival opened its eighteenth season with a Pontifical Requiem Mass in memory of David Trendell. The following morning, August 8, Kerry McCarthy gave the first in this year’s lecture series; her topic was In the Footsteps of Thomas Tallis. Both the Memorial Mass and the lecture were held at St. Stephen’s Church. On August 9th, Blake Applegate conducted the choir for the Office of Compline, again at St Stephen’s. As in prior years, the choir sang for three Pontifical Masses using the 1970 Missal, and one, directed by Kerry McCarthy on the vigil of the Feast of the Assumption, from the Missal of 1962. Bishop Basil Meeking of Christchurch, New Zealand, celebrated all four Masses. The academic component of the 2015 festival continued Saturday, August 15, with British conductor, musicologist and lecturer Jeremey Summerly on Reconstructing Tallis, and Saturday, August 22 with William Mahrt, speaking on What is a Votive Mass? Sunday afternoon, August 16th, Mark Williams returned to Trinity Episcopal Cathedral to play ‘Entente Cordiale, Organ Music from England and France across the Centuries.’ Sung Choral Evensong for the Eleventh Sunday after Trinity followed Evensong, with Jeremy Summerly, conducting. The William Byrd Festival drew to a close with ‘Vox Patris: Sacred Music by Byrd and his Predecessors. The final concert at St. Stephen’s, conducted by Artistic Director Mark Williams, was followed by another memorable celebration for participants and audience alike in the parish gym. The seventeenth annual William Byrd Festival opened on Friday evening, August 8, with the concert Hear the voice and prayer: English Anthems by Tallis, Byrd and the younger generation, under the direction of David Trendell. The following morning, David Trendell gave the opening public lecture entitled Tallis, Byrd and the 1575 Cantiones Sacrae. The church of St. Stephen was the venue for both festival events. On August 10th, Blake Applegate conducted the choir for the Office of Compline, a fitting beginning to the liturgical component of each year’s festival calendar. Four Pontifical Masses were offered, three using the 1970 Missal and one, on the Feast of the Assumption, from the Missal of 1962. Bishop Meeking was the celebrant for all four Masses. Two other lectures rounded out the academic aspect of the William Byrd Festival for 2014: Kerry McCarthy’s Byrd and the Age of Exploration on Saturday, August 16, and the Saturday, August 23 lecture by William Mahrt on The Craft of Composition: Byrd versus Tallis. Sunday afternoon, August 17th, Mark Williams returned to the Rosales organ at Trinity Episcopal Cathedral. His recital, Teachers and Pupils, immediately preceded Choral Evensong for the Ninth Sunday after Trinity, with David Trendell leading the choir. The William Byrd Festival closed on Sunday, August 24. ‘Born to honor so great a teacher’: Sacred Songs by Tallis and Byrd, conducted by Artistic Director Mark Williams, drew a capacity crowd to St Stephen’s Church, primary residence of the festival since 2008. It was followed by a gala celebratory reception in the parish gym. The festival was offered this year in memory of Dr. Richard Marlow, who died in Cambridge, England on June 16, 2013. A fitting tribute written by Mark Williams for the 2013 program concluded with these words: His rare insight into the music of William Byrd, coupled with his sensitive musicianship, wit and humour, delighted audiences and singers alike. Like Blake Applegate, Director of Cantores in Ecclesia and a former choral scholar at Trinity College Cambridge, I was proud to call Richard Marlow both my mentor and my friend. We are proud to continue his legacy in this year’s festival as we celebrate the contribution he made to all our lives and to the world of music. Everyone who has been part of this festival over the past sixteen years owes a debt of gratitude to this remarkable man, none more than the musicians and scholars involved in the production of, and participation in, Portland’s William Byrd Festival. We will ever forget his influence and friendship. All three public lectures were well-received and well attended. On Saturday, August 10, David Trendell spoke on Byrd and William Leighton’s The Tears or Lamentations of a Sorrowful Soul. The following Saturday, August 17, Dr. Kerry McCarthy, whose definitive biography of Byrd was recently published by Oxford University Press, presented an engaging lecture entitled Writing about Byrd. August 24 Dr. William Mahrt answered the question, What is a Motet? Byrd’s three Mass settings were sung August 17th, 18th and 24th. On The Feast of the Assumption, August 15th, a Pontifical High Mass according to the 1962 Missal was celebrated by Bishop Basil Meeking at Holy Rosary Church. Bishop Meeking, Christchurch, New Zealand, has offered celebrated Festival Masses since its inception; this year, all Masses were offered for the repose of the soul of Dr. Marlow. Compline was sung at St. Stephen’s Church on August 14th, conducted by Blake Applegate. Evensong on Sunday afternoon August 18th, once again at Trinity Episcopal Cathedral and conducted by David Trendall, was preceded by Mark William’s organ recital According to the Scriptures. The opening concert, Liturgy and Lamentation, choral works from Byrd’s Gradualia and Tears or Lamentations of a Sorrowful Soul (upon which he based his afternoon lecture) was directed by David Trendell and featured the Festival Chamber Choir. Mark Williams conducted the final concert, Justorum animae; music in memory of Dr. Richard Marlow. A profoundly moving evening, the concert featured favorite motets sung by Cantores in Ecclesia under his direction. The evening ended with a gala reception, which concluded our 2013 festival year. Festival organizers and participants were saddened to learn that Dr. Marlow would unable to return as Principal Conductor for the 15th anniversary of the Byrd Festival. Although not yet permitted by his doctor’s to travel, his programming advice and artistic direction did much to shape and fashion this year’s celebration. We fervently hope that he will be back in 2013, as does he. Kerry McCarthy, longtime contributor to the William Byrd festival both musically and academically, gave the opening lecture on “Byrd’s Three Masses.” Dr. McCarthy’s biography on William Byrd will be published by Oxford University Press in 2013, and it is hoped that she will be available for a book signing at next year’s Festival. Other public lectures were “Byrd and the Birth of the Verse Anthem”, David Trendell, and “Byrd and the Lament”, William Mahrt. In addition to Byrd’s sung Masses, celebrated by the Most Rev. Basil Meeking for the Festival each year since its inception in 2000, were the liturgical services of Compline and Choral Evensong directed by Blake Applegate and David Trendell. The organ concert by Mark Williams was entitled “Variations.” The Festival Chamber Choir, under the direction of David Trendell, presented “To my ancient and much reverenced Master, William Byrd”, an evening of verse anthems by Byrd, Gibbons and Tompkins, for our opening concert. The final concert with Cantores in Ecclesia, under the direction of Mark Williams, was “Some solemne, others joyfull: Motets and anthems of penitence and rejoicing.” A special 15th year reception ended a most successful anniversary celebration. From the title page of the 14th Annual William Byrd Festival program: All music at the Festival will be performed as a tribute to Dr. Richard Marlow, who is not able to join us this year because he is recovering from a recent illness. Also, all Masses will be celebrated for the sake of his speedy recovery. The 2011 Festival Chamber Choir, David Trendell, conductor, was joined by narrator Kerry McCarthy for ”Write all these down,” featuring Byrd’s “Psalms, Songs and Sonnets” (1611) for the opening concert of the 2011 Festival. Once again, Sung Compline at St. Stephen’s and Choral Evensong at Trinity Cathedral directed by Blake Applegate and David Trendell, respectively, added richness to the liturgical performances of Byrd’s music. A recital, “Fanstasia” with Mark Williams, preceded evensong at Trinity Cathedral. Kerry McCarthy (“1611: William Byrd and the King James Bible”), David Trendell (“Cantiones Sacrae Revisted”), and William Mahrt (“The Various Genres of Byrd’s Music”) provided the three Saturday morning lectures. Byrd’s three Mass settings were sung for Pontifical High Masses at Holy Rosary and St. Stephen’s, and Mass for the Feast of the Assumption was celebrated by Bishop Meeking at Holy Rosary on August 15th. Mark Williams admirably conducted the final concert in Richard Marlow’s absence, “Byrd in manuscript and print.” It was preceded by a pre-concert talk with William Mahrt, and followed by the final Festival event, our traditional reception for participants and members of the audience. 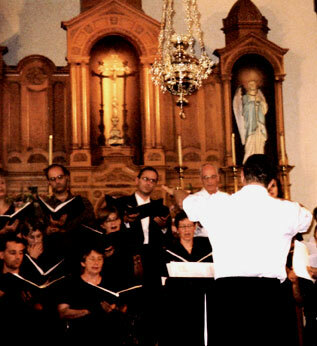 The opening concert for tenor and keyboard, featuring Oliver Mercer and Mark Williams, was “William Byrd, the Euro-skeptic: his dedication to English style and sensibility.” Two Pontifical High Masses were offered at St. Stephen’s Church and two at Holy Rosary, including Mass on the Feast of the Assumption from the 1962 Missal. In addition to Choral Evensong directed by Dr. Marlow at Trinity Cathedral, Sung Compline was added to the Festival program at St. Stephen’s Catholic Church, directed by Blake Applegate. Mark Williams’ concert on Trinity Cathedral’s Rosales organ was “Byrd and Bach, an organ recital featuring the music of two giants of keyboard composition.” Lectures included “From the library of William Byrd” (Kerry McCarthy); “Traditions of performing Byrd’s music” (David Trendell); “The Lamentations of Jeremiah by the English composers” (William Mahrt); and Dr. Mahrt’s informative pre-concert talk. The final concert, followed by a reception, was “In lamentation and in joy: the music of William Byrd,” conducted by Richard Marlow. David Trendell and Kerry McCarthy were joined by violists de gamba Craig Trompeter and Joanna Blendulf, with members of the Wildwood Consort, in the opening concert "Apt for Viols and Voyces; an illustrated recital of songs and instrumental music by William Byrd." This year the choir sang three Pontifical High Masses, Mass for the Feast of the Assumption of the Blessed Virgin Mary (1962 Missal), and Choral Evensong. Evensong, at Trinity Episcopal Cathedral, was preceded by "British Keyboard Music from Byrd to Berkeley," a journey through the organ music of Great Britain across four centuries with organist Mark Williams. Lectures included David Trendell's "Byrd and the Song Motets" and William Mahrt's "At the Extremes of the Liturgical Year: Byrd's Epiphany and Ascension." The pre-concert lecture, given by Dr. Mahrt, introduced "Music for Ascension Day and Twelfth Night" from Byrd's 1607 Gradualia, and the 12th Annual Byrd Festival closed with a festive reception at our host parish church, St. Stephen's. 2008 marked the Festival’s first season in Cantores in Ecclesia’s new home, SE Portland’s St. Stephen’s Church. Mark Williams and Kerry McCarthy joined for “A Merry Noyse – An Illustrated Recital: The Story of William Byrd”, the opening concert of our 11th year. The first Pontifical High Mass, 1962 Missal, was for the Feast of the Assumption, August 15th, with three other Masses on the 16th, 17th and 23rd. Choral Evensong was once again sung at Trinity Episcopal Cathedral, preceded by “From Byrd to Bach; Two Hundred Years of keyboard Music in Europe” (Mark Williams, organ.) William Mahrt’s lecture was on the “Words and Music in Byrd’s Gradualia,” a theme expanded in his pre-concert lecture on August 24th in anticipation of “More Music from the Gradualia”, the final Festival Concert. The opening lecture on August 11th, given by Mr. Trendell, explored “Byrd’s Unpublished Motets.” This year Cantores in Ecclesia was pleased to sponsor the return of mezzo-soprano Clare Wilkinson of London, whose concert “Framed to the life of the Words” featured the keyboard artistry of Mark Williams and the words of the composer as read by London actor Mark Denham. A Pontifical High Mass from the Missal of 1962 was offered on the Feast of the Assumption, with Novus Order Masses held on the 18th at St. Patrick’s and the 19th at Holy Rosary Church, NE Portland. Later on the 19th Mark William played the Trinity Cathedral organ for an afternoon of “Byrd and his Tudor Friends”, followed by Choral Evensong. The second public lecture was given in Holy Rosary’s Siena Hall by Dr. William Mahrtt, who spoke on “Extremes within the Gradualia: Easter vs. SS Peter and Paul.” The fourth and final Pontifical High Mass was sung on August 25th, and our 10th anniversary year concluded with music for the Gradualia 1607 in a gala closing concert. In 2006, Cantores in Ecclesia brought Byrd home to the resonant acoustic of historic St. Patrick’s Church. “How can we sing the Lord’s song in a strange land? Recusant motets from Cantiones sacrae 1589 & 1591,” directed by Mr. Trendell and featuring ten members of the choir and Mr. Williams, harpsichord, was the opening Chamber Concert. The following evening, a Pontifical High Mass for the Vigil of the Feast of the Assumption was celebrated according to the Missal of Paul V, a schola from Cantores in Ecclesia singing the plainsong Ordinary and Proper from Byrd’s 1605 Gradualia under the direction of Dr. McCarthy. Mr. William’s concert, “Flights of Fancie - The Keyboard Music of William Byrd” preceded Choral Evensong (selections from Byrd’s Great Service) at Trinity Episcopal Cathedral. Lectures titles were “The Economy of Byrd’s Gradualia: Process and Style” (Dr. Mahrt); “Byrd’s Masses in the context of sixteenth century settings of the Mass Ordinary” (Mr. Trendell); and “Byrd and Friends” (Dr. McCarthy). The Festival concluded in concert with “More Music from William Byrd’s Gradualia." The Festival was proud to welcome Dr. Joseph Kerman, Emeritus Professor of the University of California, Berkeley, who spoke on “William Byrd, Catholic and Careerist.” Other 2005 lecture topics were “Byrd: The Composer for the Anglican Church” (Mr. Trendell), and “Rose Garlands and Gunpowder: Byrd’s Musical World in 1605.” (Dr. McCarthy); Dr. Mahrt gave the pre-concert lecture. Trinity Episcopal Cathedral hosted Choral Evensong (Byrd’s Great Service) and Mr. Williams’ recital, “Sacred and Profane: the Keyboard Music of William Byrd.” Latin Masses were at Holy Rosary and the Grotto, also the site of the opening Chamber Concert, “Songs of Sundrie Natures: Consort songs and Songs for Three Voices,” featuring Mr. Blake Applegate, tenor, Ms. Jo Routh, alto, Mr. David Trendell, baritone and Mr. Mark Williams, organ. Music from the Gradualia was performed for the final Festival Concert. Dr. Kerry McCarthy, now Assistant Professor of Musicology at Duke University, returned to direct the choir in Byrd’s 1605 Gradualia for the Feast of the Assumption. A Chamber Concert, “Fair British Isle: English Songs by William Byrd”, featured Mr. Blake Applegate, tenor and Assistant Director of Cantores in Ecclesia; Ms. Amanda Jane Kelley, soprano; Mr. David Trendell, Baritone; and Mr. Mark Williams, organist. Lectures, again at Reed College, were “Savonarola, Infelix ego, & Byrd” (Dr. Trendell) and “William Byrd’s Art of Melody” (Dr. Mahrt). Mr. Williams’ organ concert, “The Garden of Eloquence: Musick to Delight the Eares”, preceded Choral Evensong (Great Service) at St. Mark’s; sung Latin Masses were at Immaculate Heart, Holy Rosary and the Grotto Chapel. St. Mary’s Cathedral again hosted the final Concert featuring music selected from Byrd’s Cantiones sacrae. A highly regarded musicologist and scholar, Dr. Brett was a great supporter of the Festival and choir. The 2003 William Byrd Festival was dedicated to his memory. The Festival opened with a Chamber Concert featuring London countertenor, James Laing, and Pacific Northwest Viols. Held in the chapel of the Grotto of Our Sorrowful Mother (also the venue for two of the three sung Masses this year), the concert was titled “Triumph with Pleasant Melody: Consort Songs from 1588 and 1589.” Lectures, moved this year from St. Patrick’s to the campus of Reed College, covered “Byrd’s Musical Recusancy: A Discussion of the Cantiones sacrae of 1589” (Dr. Trendell) and “Grave and Merrie, Major and Minor: Expressive Paradoxes in Byrd’s Cantiones” (Dr. Mahrt). Choral Evensong (Byrd’s Great Service) was preceded by Mr. Williams’ organ recital (“The Spirit of the Dance: Keyboard Works by William Byrd”). The Fifth Annual William Byrd Festival final concert was “Cantiones sacrae and Songs of Sundrie Natures, 1589” at St. Mary’s Cathedral. Mr. Williams returned to Portland from London with fellow musicians David Trendell, King’s College, and Clare Wilkinson, mezzo-soprano. Expanded from one to two weeks, the Fifth Annual William Byrd Festival opened with their Lecture/Vocal Recital “Why do I use my paper, ink and pen? : Context and Meaning in William Byrd’s Consort Songs.” Choral Evensong remained at St. Mark’s Cathedral, once again preceded by Mr. Williams’ recital, “The Flourishing of European Keyboard Music: William Byrd and His Contemporaries in Europe,” with Solemn Latin Masses again celebrated at Holy Rosary and St. Patrick churches. Dr. Mahrt spoke on “Byrd’s Attitude to Text”; music performed in concert was taken from the 1575 Cantiones sacrae. The Byrd Festival was honored to host Dr. Philip Brett, general editor of The Byrd Edition and Distinguished Professor of Musicology at UCLA, whose lecture was entitled “Blame Not the Printer: William Byrd’s Publishing Drive.” Dr. Mahrt was joined by Mr. Williams for his opening Lecture/Demonstration, “William Byrd the Organist: the Context of his Keyboard Music.” Mr. Williams, St. Paul’s Cathedral, London, showcased “Keyboard Pieces of Byrd’s Time” at the Cathedral Parish of St. Mark. Choral Evensong featured Byrd’s Great Service. Beginning this year, the Gregorian Proper for the sung Latin Masses was sung by the boys and girls of Cantores in Ecclesia under the direction of Mr. Applegate. The Festival concluded at St. Patrick’s Church with a concert from Byrd’s second book of Cantiones sacrae (1591). This year saw additions to the festival schedule. Choral Evensong at Trinity Episcopal Cathedral with Byrd’s setting of the Magnificat, Nunc dimittis and anthems was preceded by an organ recital “Byrd’s Sacred Keyboard Pieces, Mark Williams, London. Three Pontifical High Masses at St. Patrick’s Church were celebrated by the Most Rev. Basil Meeking. Lecturers were Dr. McCarthy (“A Composer for All Seasons: Byrd’s Gradualia, Four Hundred Years Later”) and Dr. Mahrt (“Byrd’s Development as a Composer of Cantiones”), with music for this year’s Festival Concert taken from Cantiones sacrae, 1589. The Most Rev. Basil Meeking, retired Bishop of Christchurch, New Zealand, joined the Festival in 1999 for two Pontifical High Masses at St. Patrick’s; a Solemn High Mass was celebrated at Northeast Portland’s Holy Rosary Church. Dr. Kerry McCarthy, at that time a Stanford Doctoral candidate writing her dissertation on Byrd’s Gradualia, lectured on “Reform and Revolution in Tudor Church Music”, while Dr. Mahrt returned to give the pre-concert talk and two lectures: “The Masses of William Byrd” and “Things Old and New in the Cantiones sacrae.” Selections from the Cantiones sacrae (1589), a collection of 34 motets written by Byrd and his teacher, Thomas Tallis, were performed in concert at St. Mary’s Cathedral. St. Patrick’s Church in Northwest Portland hosted all Festival events, including Byrd’s Masses for Three, Four and Five Voices. In addition to his pre-concert lecture, Dr. Mahrt spoke on “William Byrd’s Masses and Motets and the Transformation of Genre and Function.” The Festival Concert featured selections from Byrd’s Cantiones sacrae I (1589), Cantiones sacrae II (1591) Gradualia I (1605), and Gradualia II (1607) and motets from 1570 and 1615. The concert ended with a Gala Reception, a tradition that has continued throughout subsequent years. © 2019 Cantores in Ecclesia. All Rights Reserved.